Poinsettias and chrysanthemums go together like, well, holidays and happiness! If you’ve been plunking down your poinsettias all by themselves, it’s time to jazz up your arrangements and give them some decorating companionship. 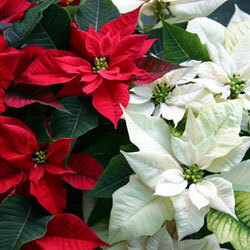 White mums provide a crisp background making poinsettias truly pop and bringing instant distinction to the duo. Snuggling two white mums and a poinsettia into a basket or container, and wrap it together with a coordinating bow for a finished look. Alternating white mums and red poinsettias in a small wreath around a large pillar candle or series of pillars for an elegant centerpiece. Whimsical arrangements that bring mums and poinsettias together in a star or Christmas tree shape, especially if you tier the plants for vertical interest. Creating stripes of plants that mimic the tasty colors of candy canes or peppermints, especially along a hearth or as a table runner. Using both flowers in a bold, tall vase to serve as a show-stopping centerpiece or elegant hearth or hallway decoration. Even with just two colors, it’s amazing how many holiday arrangements you can create! You can also use white mums with other colors of poinsettias. Pink poinsettias with white mums cast a soft and romantic glow, perfect for a holiday wedding or anniversary. Pairing golden poinsettias with white mums evokes instant chic and elegance for a more formal affair. Orange-red poinsettias may be ideal for a fall celebration and can pair not only with white mums, but other autumn colors as well. Bright pink poinsettias look funky and fresh paired with bright white mums, or try variegated or marbled poinsettias that are set off by solid-colored red or white mums. While just these flowers make quite an impact when arranged together, there are fantastic, easy accents you can add to make the most of both types of blooms. For the best centerpiece, arrangement or floral décor of the season, consider tucking a few of these easy accents in with the blooms. With just a little arranging, you can easily pair poinsettias and mums to take your holiday flowers to new heights in elegance, beauty and festivity.